London mining sector returned to normal after massive funding flushed into the flotation of Glencore, which closed out the first week on the market opened slightly weaker at 523p. That diversion of funds meant that any sellers found the market pretty weak, and the rumour was that short sellers were also out in force capitalising on that trend, and ploughing their profits back into Glencore. If so, as those positions unwind, there might be something of a bounce. Commodity prices trended higher, led by precious metals. Gold climbed to US$1,537 per ounce while silver strengthened nearly three dollars to US$37.95 per ounce. Platinum rose to US$1,805 per ounce and palladium climbed to US$759 per ounce. In base metals, copper climbed to US$9,151 per tonne, or US$4.15 per pound, as concerns about supply in China dominated. Nickel continued to slide and closed at US$23,125 per tonne. Zinc closed higher at US$2,266 per tonne. The majors all moved higher. Rio Tinto closed 3.3 per cent higher at 4,249p, BHP Billiton climbed 1.4 per cent to 2,394p, Anglo American climbed 1.4 per cent to 2,992p and Xstrata gained 2.1 per cent to close at 1,424p. Amongst companies in the news, Lonmin became the latest miner to be struck by employee unrest as it was forced to start dismissing employees who have been taking part in industrial action at its Karee operations since 17th May. Karee employs around 9,000 people and the company plans to start recruiting replacements once the dismissals are complete. Markets shrugged of that news, and the shares followed platinum higher, closing up 3.2 per cent at 1,572p. There was happier news, though, for Eastern Platinum. Shares in Eastplats rose two per cent to 63p after it was able to resume operations at its Crocodile River mine after it reached a deal the National Union of Mineworkers on workers’ wages. Operations are returning to normal after the end of the occupation by 155 employees and a strike by a further 480 employees, which disrupted production and damaged underground infrastructure. Management estimates that this action will result in lost production of 7,000 ounces of platinum group metals. Gold producer Kirkland Lake Gold achieved record production of 10,175 ounces in April from its operations in Ontario, Canada. Quarterly production of over 10,000 ounces lifted total output in the year to April to 81,860 ounces. These are both record production figures for the company, and the shares closed 2.7 per cent higher at 906p. In Africa, Goldplat has completed the purchase of the Banka mining lease in Ghana from Gulf Coast Resources. Banka has a 10-year renewable mining lease for gold and associated minerals over an area of 29 square kilometres. Goldplat has previously been viewed as a waste recycler, but this is the company’s third mining project, so it’s now getting established among the ranks of the true miners. The company settled the US$1.6 million consideration out of internal resources. The shares climbed 3.6 per cent to 11.53p. Meanwhile, Greenland-focused Angel Mining has completed commissioning of the process plant at its Nalunaq project and is now producing gold. Production should ramp up to approximately 2,000 ounces of gold per month. Meanwhile, the company continues to progress construction of the upper terminal at its flagship Black Angel zinc mine. The shares slipped 2.8 per cent to 3.28p. Elsewhere, iron ore pellets exporter Ferrexpo issued a positive trading statement which confirmed that it has maintained production at full capacity and has increased sales. It’s also got rising input costs under control, in spite of higher commodity prices and rising inflation in Ukraine. The group confirmed that demand remains strong in a strengthening price environment, and that it is moving to pricing agreements that are adjusted quarterly in arrears with a one month lag. The shares closed 1.2 per cent lower at 436p. Amongst junior explorers, Stratex International has formed a strategic alliance with major copper producer Antofagasta to undertake exploration for copper and copper-gold deposits in Turkey, outside of Stratex’s existing licence areas. Under the agreement, Antofagasta will fund US$1 million during the first 16 months whilst Stratex manages initial target generation and exploration. Stratex slipped 1.1 per cent to 6.97p whilst Antofagasta climbed 8.7 per cent to 1,312p. Mwana Africa was one of the week’s biggest losers. Its shares shed nearly nineteen per cent to close at 4.88p after it raised £9.27 million via an institutional placing at 5p. The proceeds will help fund the drilling programme at the Zani-Kodo gold project and will pay for further exploration at the Semhkat base metals concessions in the Democratic Republic of Congo. In the far east of Russia, Amur Minerals has closed an early settlement for the equity swap agreement entered into with Lanstead Capital last July. This has allowed Amur to receive advance funds of £2.07 million. That positions the company nicely for the next stage of development of its Kun Mani nickel project, and the shares climbed nearly nineteen per cent to 15.41p. In South America, Herencia Resources has returned further encouraging exploration results from its Paguanta project in northern Chile, where results showed up to 2.6% per cent copper and 202 grammes per tonne of silver from surface sampling. That, say the boffins, considerably enhances the porphyry prospectivity of the project. The news was positively received and the shares climbed 26.5 per cent to 3.1p. Meanwhile, sub-sea pioneer Nautilus Minerals has launched a marketed public offering to raise around C$150 million to fund the development of the off-shore Solwara 1 project in Papua New Guinea, including its share of the costs of the vessel. Final pricing will be determined by market conditions and the shares firmed 2.8 per cent to 159p. Finally, a faint light flickered at the end of a very long tunnel for EMED Mining in its seemingly-endless efforts to secure permitting to restore production at the Rio Tinto copper mine in Andalucia, Spain. The company has received formal approval from the Department of Culture and Heritage of the Andalucían Government for its restart plans. This followed the government’s recent announcement that it would endeavour to facilitate the mine restart. EMED climbed 8.9 per cent to 10.89p. It might look that way if you use only the all ordinaries index as a guide. But a one per cent overall fall by the broadest measure of the market hid what was a modestly firmer tone among the miners, and an ever better tone among the gold companies. The metals index managed to post a rise of half a per cent. The gold index was up by 1.6 per cent thanks to the higher US dollar gold price, which offset a recovery in the exchange rate. The Australian currency rose by US2 cents over the week. Before running through prices, perhaps a quick tour of the major news events among the miners. Tax, naturally, remains high on the agenda, though this week there was an interesting twist as the national government in Canberra hammered away at its problem state, Western Australia, and WA in turn, said it was turning its face more towards Beijing than Canberra. Now that is interesting, because WA is where you’re sitting. Precisely, and it is becoming a very interesting place to be as the mining boom, mark two, gathers pace. A few numbers tell the story of Australia’s two-speed economy, as the minerals and oil-rich west steams away from the rustbelt manufacturing east. Five years ago, WA accounted for around 30 per cent of Australia’s export income. That number, thanks to high iron ore and petroleum prices, has risen to 42 per cent, and by the end of the decade is tipped to pass 50 per cent. What makes that growth trajectory more significant is that so much of the country’s income is coming from a state with just 10 per cent of the population. Isn’t WA the state that has an active secession movement? We do, but no-one takes it seriously at a political level. It’s a totally different matter at the financial level, though, which is why the comment about looking more to Beijing than Canberra holds weight. One part of Australia is at the epicentre of a boom, and welcoming it. The other part is in a funk and can only think how to tax the bit that is performing strongly, without joining in the game by encouraging resource development in the south-east. You’re in for interesting times, hopefully without the troubles that the famous Chinese curse can bring. Oh, I think the interesting times have arrived. They’re just going to get more interesting. Enough chit-chat, time for prices, starting with the best of the movements and any companies that are doing something newsworthy. Among the gold companies that caught the eye last week was PMI Gold (PVM) which we took a close look at two weeks ago. On Wednesday PMI it reported a fresh suite of encouraging assays from its Obotan project in Ghana. The best intersections included a whopping 125 metres at 2.18 grams a tonne from a depth of 271 metres, with a rich eight meter zone towards the end of the hole running at 19 grams per tonne. The data from the current drilling will lead to a resource upgrade in the September quarter. On the market, PMI added A11 cents to close the week at A56 cents, but did get as high as A59.5 cents in early Friday trade, which is handsomely higher than A48 cents the shares were at when Minesite gave the stock a kick along. Hopefully a few readers took note. Back to prices now, please. There was a solid recovery from Allied Gold (ALD) which had been sold off as it contended with a few issues at its Pacific island mines. It gained A5.5 cents to A51.5 cents. Elsewhere, Cobar Consolidated (CCU), the pure silver miner emerging in New South Wales, added A3.5 cents to A88 cents after receiving government development approval for its Wonawinta mine. Meanwhile Medusa (MML) steamed ahead thanks to presentations made to London investors during the week, closing the week at A$8.24 for a gain of A34 cents, just short of its all-time high of A$8.38. Good price-news was harder to find outside of the gold sector, although one eye-catching move was a very sharp rise by Territory Resources (TTY), a small iron ore miner which has accepted a cash takeover offer from South Africa’s Exarro. That deal which boosted Territory’s price by A17.5 cents to A45.5 cents. Another company with iron ore we rarely hear from, Altura Mining (AJM), had a good week too, putting in a rise of A3.5 cents to A21 cents. Altura also has some coal, and speaking of which, two pure coal companies also generated a bit of investor interest. New Hope (NHC) hit a fresh 12 month high of A5.26, up A29 cents over the week, and Aston (ATZ) also reached a fresh high of A$9.90, up A49 cents. Let’s shift across to a call of the card, starting with gold. Most of the other moves were modest, but the direction was positive. St Barbara (SBM) rose A6 cents to A$1.87, while its takeover target Catalpa (CAH) added A2 cents to A$1.74. Azumah (AZM) rose by A2 cents to A56 cents. Gryphon (GRY) gained A4 cents to A$1.57. Kingsgate (KCN) continued its recovery with a rise of A21 cents to A$7.94. Northern Star (NST) put on A 2.5 cents to A40 cents. Beadell (BDR) added A3.5 cents to A83 cents. Gold Road (GOR) rose by a tiny half a cent to A60 cents, but is attracting increased attention as a drilling program at its Yamarna project gathers pace, and might be worth a closer look soon. Offsetting the gains were a number of gold companies in retreat. Adamus (ADU) lost A4 cents to A64 cents. Perseus (PRU) fell by A4 cents to A$2.68. Chalice (CHN) slipped A3 cents lower to A31 cents. Focus (FML) ended the week at A7.3 cents, down A0.2 of a cent, but with some interesting developments underway, and another company worth a closer look. It was a mixed picture in the copper space. Nickel trended down, and zinc stocks trended up, just. The best of the copper companies was Sandfire (SFR) which added A26 cents to A$6.90. Rex (RXM), the other near-term mine developer, rose by A8 cents to A$2.67. Other movers included CuDeco (CDU), up A10 cents to A$3.28, Exco (EXS), up A2 cents to A65 cents, and Horseshoe Metals (HOR), up A1 cent to A27.5 cents, and worth keeping an eye on. Offsetting the rises were declines by OZ (OZL), down A5 cents to A$1.34, Marengo (MGO), down A1 cent to A30 cents, and Metminco (MHC), down A2.5 cents to A35.5 cents. Hot Chili (HCH) called for suspension pending an announcement with a last sale at A61 cents. Mincor (MCR) was the best of the nickel companies, but its rise of just A1 cent to A$1.09 tells the story. Interest in Mincor was sparked by its move into a gold project in Papua New Guinea. After that it was all down, or flat. Western Areas (WSA) lost A10 cents to A$6.15. Panoramic was A6 cents lighter at A$1.94. Minara (MRE) eased back by A3.5 cents to A74.5 cents, and Mirabela (MBN) slipped A5 cents lower to A$2.01. Blackthorn (BTR), surprisingly, was the best of the zinc companies despite losing BHP Billiton as a partner in an exploration project. It added A1.5 cents to A56 cents. Perilya (PEM) firmed by A1 cent to A59 cents. Prairie Downs (PDZ), rose by A1.5 cents to A18.5 cents, and Ironbark (IBG) was A1 cent stronger at A28 cents. Over to iron ore and coal, please. After Territory and Altura most of the iron ore moves were negative. Atlas (AGO) fell A12 cents to A$3.60. Murchison (MMX) fell A8.5 cents to A$1.85. Grange (GRR) fell A3 cents to A59 cents. Gindalbie (GBG) fell A3.5 cents to A94.5 cents. Fortescue (FMG) fell A4 cents to A$6.40 after dropping a big debt raising that had been planned in the US, a sign that the appetite for high-risk bonds has faltered in New York. Coal companies traded on a more positive note. Aside from Aston and New Hope, which we’ve already mentioned, other moves came from Bathurst (BTU), up A13 cents to A$1.20, Stanmore (SMR), up A5 cents to A$1.27, and Coal of Africa (CZA), up by half a cent to A$1.18. Macarthur (MCC) went the other way, shedding A33 cents to A$11.66, and Coalworks (CWK), slipped A5 cents lower to A69 cents. Uranium and minor metals to close, please. There wasn’t much good news among the uranium companies, despite a small increase in the price of uranium. Berkeley (BKY) was hammered on news of trouble with its partner in Spain, plunging a painful A34 cents to A48.5 cent. Other falls included Manhattan (MHC), down A5 cents to A55 cents, Bannerman (BMN), down A3 cents to A31 cents, and Energy and Metals (EMA), down A1 cent to A17 cents. The minor metals were surprisingly quiet. Rare earth companies effectively marked time. Lynas (LYC) slipped A1 lower to A$2.28, while Alkane (ALK) added A1.5 cents to A$1.84. There was a mixed picture in tin. Venture (VMS) rose a healthy A6 cents to A44 cents, while Kasbah (KAS) lost half a cent to A24.5 cents. Wolf (WLF), which is more a tungsten than tin play was steady at A39.5 cents. Lithium companies weakened, as did the potash players. Despite a nice rebound in metal prices, the holiday-shortened trading week was rather uneventful. It could be the calm before the storm, though, as the highly-anticipated field season is just getting underway in Canada’s Yukon Territory. Once all the trading was done, the TSX Ventures Exchange, home to more junior exploration companies than anywhere else in the world, had added 3.41per cent, while the TSX Gold Index had rallied 3.79 per cent. Even so, it was a rough week for shareholders of Lundin Mining. The base metal miner has failed to find a suitable buyer for any or all of its assets. So for now it will be status quo for the company. That had those hopeful for corporate activity heading for the exits and Lundin ended the week down C$1.68 at C$7.16. But talking of corporate activity, I see the Zambian Competition and Consumer Protection Commission has given the green light to Barrick Gold's acquisition of Equinox Minerals. Yep, the one time suitor of Lundin is about to become part of the world’s largest gold miner. Go figure. Barrick has made suitably deferential noises as regards the CCPC’s ruling, and all-in-all now looks well positioned to close the deal. Barrick added C$1.98 on the week to close at C$46.36. Meanwhile, shares of Capstone Mining managed to add C$0.08 to close at C$3.48 after the company reported first quarter earnings amounting to US$18.9 million or US$0.08 per share. Copper sales rang in at 22.8 million pounds, and cash costs were US$1.59 per pound. For the year, Capstone expects to produce between 80 million and 85 million pounds of copper from its Yukon and Mexican operations. Ahead of presidential elections due on June 5th, Bear Creek Mining got some bad news from Peru. The Peruvian government has issued a decree setting up a 180-day multi-sectorial commission composed of ministers and elected local officials to assess all mining activities within the provinces of Yunguyo and Chucuito. The move is in response to two weeks of strikes in the region. Bear Creek’s Santa Ana project is located within the Chucuito province, and Bear Creek ended the week down C$0.75 at C$6.98. And speaking of strikes, Eastern Platinum added C$0.07 to close at C$1.03 after the company announced that the strike at its Crocodile River mine in South Africa was over. Trelawney Mining and Exploration tagged 117 metres of 1.05 grams gold per tonne from its Chester project in northern Ontario. Trelawney ended the week up C$0.33 at C$4.28. Not to be outdone, Kimber Resources hit 51.9 grams gold per tonne and 1,076.7 grams silver per tonne over 5.2 metres on the Carmen deposit on its Monterde project in Mexico. Kimber closed out the week at C$1.64 for a C$0.39 gain. Elsewhere, shares of Claude Resources added C$0.07 to close at C$2.19 after the company reported a 3.2 metre intercept grading 84.66 grams gold per tonne on the Neptune target on its Seabee project in Saskatchewan. And Canaco Resources continued to deliver the goodies at its Hendeni gold project in Tanzania. The latest results included 23.96 grams gold per tonne over 17 metres. Canaco ended the week up C$0.59 at C$4.43. Meanwhile, no news was good news for plenty of Yukon-focussed investors. Shares of Kaminak Gold were on the move as the Yukon gold explorer gears up for a major drill program on its Coffee project. Kaminak ended the week up C$0.49 at C$3.74. Another major Yukon player to watch this summer is Atac Resources and its Carlin type targets. Atac ended the week up C$0.19 at C$6.60. Meanwhile, Rockhaven Resources has also jumped to life as it makes its own plans in the Yukon. The junior, which closed at C$1.43 for a C$0.23 gain, is about to resume drilling on its Klaza gold-silver property. Memorial Day weekend in the United States on Monday means that trading on the Canadian side of the border will be lighter than usual as the week kicks off. It has been abnormally quiet on the acquisition front but we know from past experience how fast that can change. We will see what next week has in store. London- and Toronto-listed First Quantum this week posted solid results for first-quarter 2011, and headlined its objective to produce 300,000 tonnes of copper in 2011 as a whole, and 200,000 ounces of gold, extracted as by product from two of its copper mines. First Quantum's founding base of business, the central African copperbelt, straddling Zambia and the Democratic Republic of the Congo, has recently come into focus with the bid by Barrick, the world's biggest gold miner, for Toronto- and Australia-listed Equinox, which mines copper in Zambia, and is due to start mining copper in Saudi Arabia, where it also holds interests in gold-base metal projects. Barrick already produces copper, but is the first major gold miner to consciously bid for a copper miner. Good copper miners are making very good money. Cynics may well point to Barrick's spin off of African Barrick Gold in 2010, which was listed in London, and in which Barrick remains the biggest shareholder. The apparent contradictions are explained mainly by the above-average stock market valuations commanded by gold stocks, and the relative undervaluation of copper stocks, which can produce genuinely impressive cash flows and profits. The African copper belt boasts some of the world's highest in situ copper grades, and, in some cases, by-product cobalt, gold, or silver, and even uranium. First Quantum pioneered the resuscitation of the ruined once-nationalised copper mines in the central African copper belt, when it acquired Bwana Mkubwa in Zambia in the mid-1990s. First Quantum was soon mining just across the border in the DRC, at Lonshi, and achieved rapid growth on both sides of the border, attracting interest and investment to the broader area. But the DRC has proved a bitter pill for First Quantum, which saw its in-build KMT operation in the copper-rich southern Katanga Province seized in 2009, and onsold via a British Virgin Islands (BVI) shell structure. During 2010, First Quantum's Frontier mine was shuttered after further action by DRC authorities. It can be noted that upon the shuttering, various expats were noted on the mine premises, not least Tim Henderson and John Gross, who are, apparently, GM and metallurgist at a Glencore interest in the DRC, known as Mutanda Mine Mumi Copper/Cobalt Project. Approached at the time, early September 2010, for comment, Glencore politely declined. Both the KMT and Frontier cases are now in international arbitration, in Paris and Washington, respectively. First Quantum is separately suing London-listed ENRC over its announcement that it acquired a majority stake in KMT, via the BVI conduits. Some kind of revenge seems to be on the menu on the Zambian side of the border. First Quantum recently highlighted the award to it of fresh mining permits in Zambia, which continues to attract foreign investment despite heated debates, and action, and some retraction, on tax issues, over the past few years. In Katanga Province, the only major miner present at the operational level until recently was Freeport-McMoRan, the major shareholder in and operator of Tenke Fungurume, an inheritance, as such, from an earlier acquisition by Freeport-McMoRan. Earlier this month, First Quantum hosted a high profile groundbreaking at its Trident project in Zambia, where over 140,000 meters of drilling has been completed in more than 380 holes. Based on First Quantum's internally-generated resource estimates, the group is proceeding with the design of a project at Trident that could produce 150,000 tonnes of copper a year, initially, and then expand to 300,000 tonnes of copper. First Quantum is also headed towards producing material amounts of nickel, in Australia and Finland. While First Quantum heads back to its roots with Trident, its expansion from a small base in the mid-1990s has seen it become one of the world's most-demanded copper stocks. The first major miner to make conscious moves on the central African copperbelt, at least at the operational level, is Brazilian supergroup Vale, the world's No 2 miner, which recently bid for Johannesburg-listed Metorex, which operates in both the DRC (Ruashi) and Zambia (Chibuluma and Sable Zinc). Vale already has an interest in Zambia's Konkola North, which, according to Vale, ranks as the second-largest known resource on the Zambian copperbelt. This is an underground mine with estimated nominal production capacity of 44,000 metric tonnes a year of copper in concentrate, with production scheduled to start up in 2013. This project is part of a joint venture with Johannesburg-listed African Rainbow Minerals. Early in 2009, Vale acquired a 50% interest in a joint venture with ARM for CAD 81m, with the objective of looking at developing nominal production capacity of 65,000 metric tons of copper a year, at Konkola North and Kalumines. The joint venture also holds extensive further exploration interests. And then there is Toronto- and London-listed Katanga Mining, which was bailed out by Glencore in 2008 and 2009, in the wake of turmoil in markets generally. Early in 2008, Katanga Mining completed its merger with Nikanor, which held the giant KOV pit, adjacent to Katanga Mining's Kamoto interests. London-listed Nikanor raised USD 380m in cash upon listing in July 2006, and USD 777m a year later. Upon the business combination of Nikanor and Katanga Mining, USD 446m in cash was returned to Nikanor shareholders, as a capital repayment, or special dividend. The prime beneficiaries were the three major Nikanor founding shareholders: Beny Steinmetz, the UK-based Gertner family, and Daniel Gertler. JP Morgan Cazenove, pushers of the Nikanor float, were keen to remind investors that the KOV deposits boast one of the highest-grade major copper ore bodies in the world, with 172m tons of indicated mineral resources at an astonishing grade of 5.09% copper, plus a wonderful grade of 0.49% cobalt. And yet Katanga Mining continues to burn cash, even after yet another rights issue in 2009, which raised USD 245m, entrenching Glencore as the controlling shareholder. During first-quarter 2011, Katanga Mining produced copper metal and concentrate of 18,385 (first-quarter 2010: 12,458) tonnes and 635 (889) tonnes of cobalt. So-called C1 cash costs for the first-quarter 2011 were USD 1.82 (USD 1.34) per pound of copper. In a filing on 31 March 2011, Katanga Mining described its New Phase 4 expansion which, once completed, is expected to result in total plant capacity of 310,000 tonnes of copper a year. How this is to be financed is yet to be fully described. Equity investors in Katanga Mining have seen the company's issued shares increase from 78m in 2008 to 1.9bn at this point in time. For some investors, a pall remains over mining in the DRC, particularly in Katanga Province, not least on the kind of reception that the spat between First Quantum and ENRC has been given by parts of the London-based media. While Vale has shown something of an appetite for becoming involved in Katanga Province, its focus in the broader region is without question to the east in Tete Province, Mozambique, where Vale is busy commissioning the USD 1.7bn Moatize coal mine, alongside Toronto- and Australia-listed Riversdale's deposits. Moatize holds resources of more than 1bn tonnes; Moatize I has a nominal production capacity estimated at 11m tonnes of coal, 80% coking. The coal will be transported along the Linha do Sena railway to the historic Beira port. Earlier this year, the first train seen in 25 years arrived at Moatize town. At Beira, the Mozambique government is building a new facility to handle an additional 18 to 24m tonnes of coal a year. Other transnational companies with a presence in Tete include ENRC, Nippon Steel, Jindal and ETAStar. Vale, also a global leader in logistics, has bought a 51% stake in Sociedade de Desenvolvimento do Corredor do Norte SA (SDCN), which controls the Corredor de Desenvolvimento do Norte (CDN) and the Central East African Railways (CEAR). CDN holds a concession over 872km of railroad in Mozambique; CEAR holds a concession over 797km of railroad in Malawi. The "first prize" in the network would be access to Katanga Junction, which has historic railroads running in literally all directions. The vast majority are rusted and ruined. Riversdale and Tata earlier this year bought the balance of shares in Benga Power Project, a USD 1bn investment progressing to initial production in 2013-2014, to produce around 550MW of power, with the objective of increasing to 2,000MW. The miners are also looking at barging along the Zambezi River, following precedents from decades ago. Riversdale is, of course, headed towards delisting with transnational miner Rio Tinto now holding more than 70% of the shares in Riversdale. At the same time, Rio Tinto has sold out of the huge Chapudi coking coal deposit in South Africa, to Coal of Africa Limited. With corporate action in South Africa and Katanga Province likely to remain subdued for the foreseeable future, which could be quite a while, more corporate action with a Zambian focus could be on the cards. Which leads back to First Quantum, with its plans to grow to a remarkable 1m annual tonnes of copper, as early as 2015, from the 2011 outlook of 300,000 tonnes. The Kiwara PLC acquisition - now called Sentinel copper and Enterprise nickel - with USD 1bn of capex should add 400,000 tonnes a year of copper, plus, First Quantum has discovered a significant nickel orebody on the Zambian property, 150km from its flagship Kansanshi Mine. With the Ravensthorpe project in Australia (acquired from BHP Billiton) targeted to produce around 40,000 tonnes a year of nickel from the end of 2011, plus Kevitsa in Finland, at 10,000+ tonnes a year from mid-2012, First Quantum is building a significant nickel stream. The bottom line is that First Quantum has put the disappointment of losing its DRC assets far behind. First Quantum has firmly emerged as a challenger to London-listed Antofagasta's place as the No 2 base metal company in the world behind Freeport-McMoRan. When Barrick officially opens operational offices in Zambia, the game could well be on. Conditions when the price of gold and silver experienced a sharp correction was anticipated by some commentators, although the speed and depth of the sell-off might not be expected, but interesting now that some of those who called the top of the already suggested that it may be time to move back in. 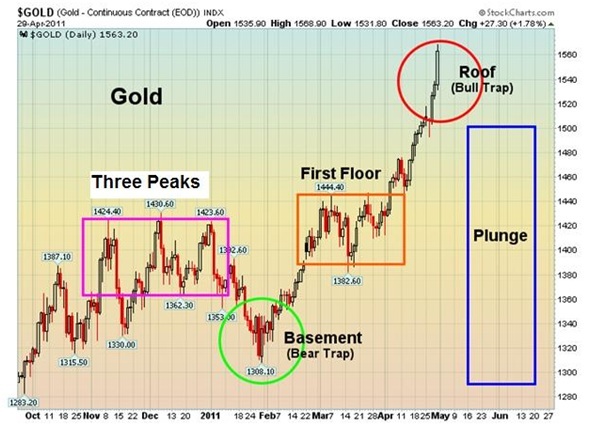 Notable among these is Peter Grandich of the well respected Grandich Letter who recommended selling gold and silver right at the top and is already telling readers to start climbing back in. Grandich says: "After literally getting out within minutes of the top in silver and gold and then watching a decline I anticipated could take weeks or months happen in a matter of days, I believe it's time to go back in and buy back those positions. I may be 10% too early but we have plenty of room given what we sidestepped. So I'm now back in fully in gold and silver." Looking at what has happened in the past week, gold has lost, from peak to current levels, just under $100 - a fall of around 6% which is not massive in the scheme of things. Silver though has lost around 30% from its peak. Momentum had carried it up far faster than was reasonable and at least one commentator had described the silver price surge, and subsequent fall back, as "an accident waiting to happen". It had risen too far too fast and to an extent the euphoria so generated had probably been partly responsible for dragging gold up a little faster than expected, or warranted. In a similar manner, silver's initial stumble, and then sharp plunge, may have also been a factor in gold losing its lustre. But the sell-off hasn't just been in precious metals. Revived general doubts about global economic strength have run over into most commodities, with investors scrambling for what they see as a safe haven - but in this respect it has been the dollar they have turned to, rather than gold and there has been a recovery in the dollar index over the past day or so which has been another contributing factor in the precious metals' decline. More sober analysis suggests, though, that the dollar is not worthy of a revival as long as the U.S. Fed keeps on pumping money out to the banks, and then supposedly to the U.S. economy as a whole - although there are serious doubts about how much of this government largesse is actually filtering down the line. History tells us that money printing on this kind of scale eventually has to lead to inflation - indeed to severe inflation. Perhaps the banks' sticky fingers have to an extent prevented this from happening so far with the government money finding its way to the investment community and boosting the stock markets rather than the economy as a whole. - Another bubble waiting to burst? Indeed all the factors which had led to the rise of gold - we'll leave silver out of it for the moment because it was speculative fervour largely responsible for that metal's over the top advance - are still with us, and at some stage the investment community will recognise this and move back into gold as the haven of preference. Whether that will happen now - or later in the year, remains to be seen. Long term gold proponent, Jim Sinclair, who has quite a following, advises gold holders to "relax". He's looking for a major upturn in gold as soon as June and is still targeting $5,000 as a longer term objective. This seems far-fetched - but then people would have said that about $1,000 gold, let alone $1500, only two or three years ago. As for silver, will we see another meteoric rise if gold does recover first. Perhaps too many people got their fingers burnt in the recent rise for a similar surge to happen in the short to medium term, and there could still be ground here for further falls befor the price stabilises and starts to rise again. Maybe a return to a gold:silver ratio of nearer 45:1 or higher (currently 42.5) may be on the cards before real progress starts to be made again here. On the bearish side, however, there are those who suggest that the decline in gold and silver may not be done yet. Technical analyst, Dr Nu Yu, points to a "Three Peaks and a Domed House" chart pattern - I guess this means something to the technical analysis community - suggesting a gold price fall of 17% to around $1290 by June, but offers no further projections beyond then. His chart is shown below courtesy of www.munknee.com. As with economists, so it is with gold analysts. There are always drastically opposing views. The trend increase in income from 2010 that continued until 2011, became the savior for gold miners, but did not deny the increase in capital and operational costs have eroded some incoming cash flow, which is reflected in the quarterly report the latest bout of eight major gold producer. So who wants to commandeer a major gold miner, or any gold miner, for that matter? Relative to the persistent gains in the dollar gold price over the past near-decade, listed major gold stocks experienced three relatively tight years from 2007 to 2009, from a free cash flow viewpoint: above all else, costs started to bite. But rising revenues came to the rescue, again, and 2010 was an excellent year, a trend which has largely continued into 2011, as reflected in the latest bout of quarterly reports from eight of the major gold producers. One conclusion to be drawn from the apparent fault lines is that while dollar gold bullion has been highly supportive for close on a decade, costs have indeed been increasing at a compound rate. Rising costs continue to erode operating cash flows, and also raise capital costs, whether at existing mines, or for new builds (where prior budgets are being persistently ratcheted upwards). If there is concern over the trends of gold majors seen in free cash flow generation, few would be likely to omit discussing Barrick's recent bid for Equinox, a copper miner. Freeport-McMoRan, which can be regarded as a gold major, given that Grasberg ranks as the world's biggest gold mine, generates the majority of its cash flow from copper. It is also No 1 in molybdenum and cobalt, a minor metal. Seen as a composite, Freeport-McMoRan generates astonishing amounts of cash, not only among miners of all kinds, but more so when compared to gold-focused miners. On this point, few major gold stocks are "pure"; Barrick and Newmont, among others, already produce material amounts of copper. In the first quarter of 2011, nearly a third of Goldcorp's turnover was from metals other than gold. And so on. While free cash flow analysis suggests that gold majors have more than a few issues to ponder, the escalating cost of capital expenditure is really rearing its head. Net debt (including cash) for the gold majors peaked at the end of 2008, and has been falling nicely since. Net debt for the eight gold majors was around USD 750m on 31 March 2011, and USD 1.3bn if Freeport-McMoRan is excluded. This raises the issue of new, specifically additional or non-replacement, production, given the incessant demand for listed gold stocks to grow. The world's biggest gold projects are very big indeed, relative to the financing required. The budget at Cerro Casale (Barrick 75%, Kinross 25%) is USD 5.2bn; at Donlin Creek (Barrick 50%, New Gold, 50%) USD 4.5bn; at Pascua Lama (Barrick) USD 3.5bn; at Pueblo Viejo (Barrick 60%, Goldcorp 40%) 3.4bn, and at Tasiast (Kinross) USD 2.7bn. While not all projects ready for build have progressed to that stage, the outlook may now be characterised more by headwinds. Barrick, for one, has this year announced sharp increases in estimated capital outlays for some of its biggest projects. Seen broadly across the global sector, there are signs of projects being delayed; some may even be put into mothballs. Current trendlines suggest that gold companies may well again be more extensively examining taps available for external funding, viz., increased debt and, of course, rights issues. For the generalist investor, if this is indeed the case, it could be surprising, given years of headlines that have emphasised the multi year bull market in dollar gold bullion. Among the broad materials market, price trends for gold have been very well accompanied by other commodities. After all, gold mines must be run on more than just positive sentiment. Swiss commodity trader Glencore GLEN.UL has lined up buyers for all of the shares in its planned $11 billion mega-float only a day into the sale process, two sources close to the deal said. Bucking a recent trend for struggling European listings, which have seen investors wait until very late in the typically two-week bookbuild to place orders, Glencore has already received demand for all the shares it is offering, including a 10 percent overallotment option, the sources told Reuters. "We had a good response on day one; there is a lot of pent-up demand," one of the sources said on Thursday. The sources said it was too soon to say where in the indicated 480-580 pence per share range the much-anticipated offering would be priced on May 18. That range, announced on Wednesday, values the company at 36.5 billion pounds ($60 billion) at the mid-point. But a steep selloff in commodities over the past week, which accelerated into a near record slump on Thursday, may encourage Glencore to price the offering toward the lower end in order to retain buyer interest. The 19-commodity Reuters-Jefferies CRB index .CRB wiped out more than two-thirds of its gains so far this year, shedding 5 percent on the day, its fifth biggest fall ever. Brent crude oil dived a record $12 at one point. "The books are covered on the full deal size, including the greenshoe," said one of the sources. "Given the amount of interest we have seen in the transaction, we thought we would be covered pretty early but I think it just reflects ... that the price range was the right price range." Demand for Glencore shares will also have been boosted by the fact it is due to be fast-tracked into the blue-chip FTSE 100 .FTSE index at the end of its first day of trading. The London and Hong Kong listing, in which Glencore is looking to raise around $7.9 billion from new shares and $2.1 billion from existing shares, will boost its firepower for deals amid a boom in commodity prices. But it will also push it into the public eye after 37 years as a discreet private company. Glencore's estimate of its future market capitalization puts the company just above the mid-point of a wide $45 billion-$73 billion value implied in its intention-to-float last month. The mid-point of analyst research was around $60 billion, though that excludes proceeds from the offering. Before the start of bookbuilding on Wednesday, Glencore struck agreements with cornerstone investors who will collectively buy around 31 percent of the total offer, one of the largest cornerstone books to date. The largest investor, Abu Dhabi's IPIC Aabar, which has already committed $850 million to the listing, also plans to invest an additional $150 million in the offering. The investors that Glencore is now courting are only being offered a small slice of the company. Cornerstones aside, if the IPO prices at its mid-point and without a greenshoe, new shareholders would own just 11.3 percent. And if all the owners of Glencore's convertible bond exercise their right to swap their bonds for stock, that figure falls to 10.7 percent, Reuters calculations show. Glencore's listing, which could be London's largest ever, will make several top directors paper billionaires, with 54-year-old Chief Executive Ivan Glasenberg set to be worth almost $10 billion. Citigroup (C.N), Credit Suisse (CSGN.VX) and Morgan Stanley (MS.N) are the joint global coordinators for the offer, joined by another 20 banks in lower ranking syndicate roles. Glencore was not available for comment. Several rating systems on the market with different parameters adopted by gold companies that will make it easier to make comparisons between companies. Barrick, the world's biggest gold miner by output and market value (capitalisation), formally introduced the reporting of "free cash flow" into its key statistics as of the release of its fourth quarter, and full year, 2010 results. Now Goldcorp, which boasts the second-biggest market valuation (capitalisation) of any gold-focused stock, has introduced the measure, in its first quarter 2011 numbers. Far from being a fad, this is one of the most useful moves by gold miners for a long time. Free cash flow cuts through marketing spin, whether from gold or matchstick makers. Its computation is easy; as Barrick puts it, "we deducted capital expenditures from adjusted operating cash flow to arrive at free cash flow". While the ongoing harmonization of accounting around the world under IFRS makes sense (US entities are starting to migrate from GAAP), income statements are arguably less useful than ever. This may be the irony of a case that's trying to please too many people for much, if not most, of the time. Cash flow, which is sacrosanct, has always been largely immune from manipulation, either by honest and well-intended standard setters, or by bent and twisted company bosses. AngloGold Ashanti also publishes free cash flow, but does not feature the measure. Another Johannesburg-based global Tier I gold miner, Gold Fields, publishes detailed numbers for what it describes as notional cash expenditure, (NCE). This it defines as operating costs (including general and administration) plus capital expenditure, which includes brownfields exploration. NCE per ounce, says Gold Fields, "influences how much free cash flow is available in order to pay taxation, interest, greenfields exploration and dividends". Reportage of free cash flow remains a rarity. Beyond the gold subsector, Alcoa, one of the doyens of global mining, believing since 1888 that it has been "inventing the future", adopted free cash flow reporting from second-quarter 2010. Alcoa says its management believes that free cash flow is a measure "meaningful to investors because management reviews cash flows generated from operations after taking into consideration capital expenditures due to the fact that these expenditures are considered necessary to maintain and expand Alcoa's asset base and are expected to generate future cash flows from operations". For gold miners, free cash flow has additional significance. For years, many gold miners, and attendant investors and speculators, have obsessed over "cash costs per ounce", a measure heavily promoted by certain gold diggers, and one that has become increasingly misleading. The measure ignores capital expenditure, which is by definition omitted from income statements, but inevitably swallows significant cash sums (both for stay-in-business and new projects). As such, cash costs per ounce can be heavily understated, when seen at the group level. Second, gold companies that have strayed into producing other metals have often fallen to the temptation of using revenues derived from such metals as a credit to mining costs. Another impressive technique is to report production of "gold equivalent ounces", much along the lines of medieval alchemists, who claimed an ability to convert base metals to gold. Again, cash costs per ounce of gold tend to be understated. "Free cash flow" cuts through all the nonsense. Barrick explains that: "Free cash flow is a measure that management believes to be a useful indicator of the company's ability to operate without reliance on additional borrowing or usage of existing cash". The measure seems to be more relevant than ever, given the worrying escalation of cost estimates for building new mines. A low free cash flow number is not by itself a concern; it may be pressed down by a period of heavy capital expenditure which, in theory at least, will translate into enhanced shareholder returns in due course. And like many static numbers that present highly dynamic situations, free cash flows are most useful when seen over a period, preferably years. Platinum's underlying fundamentals in 2010 are described as "distinctly lacklustre" and, as above-ground stocks increased for the sixth successive year, the momentum in platinum prices was arguably almost entirely a function of investor activity. GFMS identifies 550,000 ounces of ETF investment in 2010 as well as 76,000 ounces of retail investment (although this latter is taken above the line in the supply-demand balance), but even after this investment activity the market was left in a substantial residual surplus, suggesting that non-investment inventory has grown by over a million ounces in the past ten years. This increase is the equivalent of over two months' fabrication demand and gives the lie to suggestions that the platinum market is light on inventory. GFMS argues that the central planks of the case in favour of the precious metals sector are still intact and although the PGMs are primarily industrial metals, they have been benefiting from the factors bolstering gold investment. Indeed the case is made that investor sentiment in platinum has become increasingly influenced by the broader investment climate, and investor attitudes to gold in particular, given that one of platinum's drivers, the risk of supply disruptions and/or the economics of mine production has been broadly absent in the past two years, while the market has also been in surplus. Palladium's price increases, by contrast, have stemmed from a better set of underlying fundamentals, both existing and prospective, with a resultant higher percentage increase in price than platinum over the past two years, and a larger absolute gain in 2010. The Survey includes its usual in-depth analysis of all the aspects of the metals' markets and their fundamentals; there follows one interesting highlight in the shape of Chinese jewellery. Chinese jewellery has been one of the key stories of the platinum market over the past decade. After reaching almost 1.7M ounces in 2002, Chinese demand for platinum jewellery fell to 835,000 ounces in 2006, before starting a recovery. In 2009 it was close to the 2002 record at 1.6M ounces, but fell back to 1.2M ounces last year, or 62% of world jewellery demand and 18% of world fabrication demand. This 26% fall, accompanied by a small decline in Europe, while there were marginal increases in North America, meant that, with the exception of the petroleum sector, jewellery was the only end-use where demand contracted in 2010. The increase in North American demand came largely from a recovery at the luxury end of the market, rather than an overall lift. The Chinese market is price-sensitive and high prices accounted for a good part of last year's fall in the local jewellery sector, but GFMS also points out that the trade held high jewellery stocks at the start of 2010 and so there was little demand for any re-stocking, especially given the high price. (In fact there was little industrial re-stocking anywhere in the platinum using industries last year). The Group does underline the fact, however, that Chinese demand in 2009 was exceptionally high and that Chinese jewellery demand was, in 2010, the second-highest since 2004. Furthermore in metal value terms, demand was roughly level with that of 2009 and given that a good part of 2009 demand came from the trade's re-stocking, actual consumer expenditure was higher in 2010 than in 2009. GFMS produces an in-depth study of the sector and notes, inter alia, that after a rapid expansion in jewellery manufacture capacity towards the end of the past decade, retailers have had to cut margins in order to retain sales in the face of weakening consumer demand; one of the by-products of this has been a switch among manufacturers from PGM to gold and descries this shift to gold as "quite dramatic" in 2010. Although prices are expected to remain high and volatile in 2011, GFMS believes that robust economic growth and a return to normalisation of inventory replenishment by the trade will result in some modest growth in Chinese platinum jewellery offtake in 2011. GFMS is suggesting that the strength of the investment environment for the precious metals will again overpower platinum's unprepossessing fundamentals this year and that, despite the likelihood of a further significant gross surplus, prices will remain elevated. A high of $1,925 is suggested, most likely coinciding with a gold move through $1,600; while the downside is constrained to $1,675, a level that GFMS expects would be likely to attract considerable support from the jewellery market tin China, as well as renewed investment inflows. COMEX silver fell 3% on Wednesday, fell for the third straight session, and gold faltered as precious metals are under pressure to improve after a strong rally in recent weeks. However, the overall trend in gold and silver remain bullish, as concerns on rising global inflation, unrest in the Middle East and North Africa, and low U.S. interest rates drive investors to park their value in precious metals. "On the way up, it (silver) was too fast and now we are seeing a general liquidation of long positions," said a Singapore-based trader. "Silver has been falling much faster than gold, but it doesn't mean that silver will collapse from here." Gold hit record highs in 11 out of past 14 sessions and spot silver has surged more than 20 percent since mid-April to a 31-year high just below $50 on April 28. The immediate support level for silver is seen around $39, its 50-day moving average, he added. COMEX silver SIcv1 hit a near three-week low of $40.47 earlier. It shed 3 percent to $41.30 an ounce by 0326 GMT, extending an 8-percent loss from Tuesday, after the CME Group hiked margin requirement for the third time in a week. Higher margins make speculation more expensive, adding to the pressure on silver prices. Spot silver fell by 0.9 percent to $41.26. Investment interest in silver ebbed, as holdings in the iShares Silver Trust , the world's biggest silver-backed exchange-traded fund, dropped to a seven-week low of 10,909.06 tonnes, 4 percent off the record high hit on April 25. The gold-silver ratio, used to measure how many ounces of silver is used to buy an ounce of gold, recovered to above 37 from below 32 last week, its lowest since early 1980s. Spot gold declined 0.5 percent to $1,532.60 an ounce, headed for a third straight day of loss. COMEX gold GCcv1 also lost half a percent to $1,533.20. The statement is unlikely to dampen the long-term sentiment in gold, traders and analysts said. "It doesn't turn the market around. All the actions will only slow down the pace of inflation," said the Singapore-based trader. China has raised interest rates four times since last October and banks' required reserve ratio to a record level, to fight stubborn inflation. "China's rate hikes tend to have a rather short-lived impact on global gold market," said Li Ning, an analyst at Shanghai CIFCO Futures. "The key is when the U.S. will start raising interest rates."